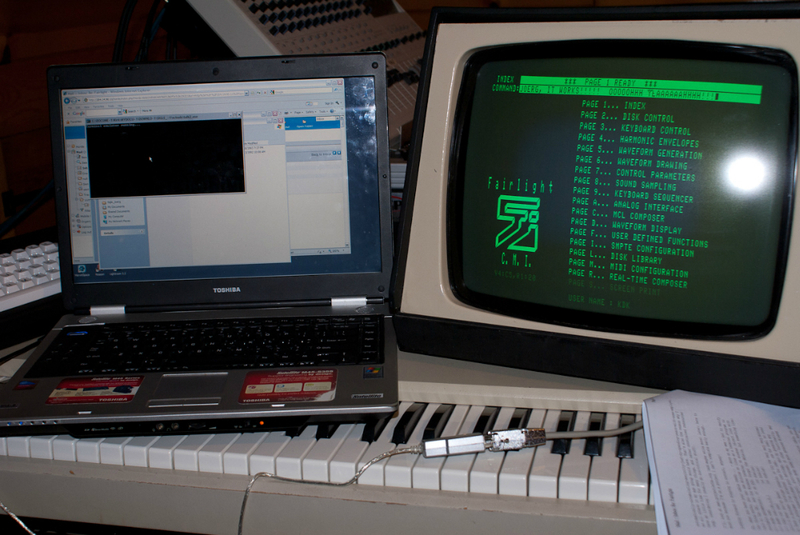 Here’s a photo of my Fairlight IIx connected via serial port to my laptop. The laptop is connected with a SIIG USB to Serial Port adaptor and it is plugged in the the Alphanumeric Keyboard connector on the back of the Fairlight Music Keyboard. The laptop is a regular, old Toshiba Satellite (model M45-S355 from about 2006). It has an Intel Pentium M 750 / 1.86 GHz processor and is running Windows XP. The PC and Fairlight are connected using a custom made serial cable adaptor specially made for use with the Fairlight. If you look closely in the Fairlight Command Line, you can see what I’ve typed on the PC showing up on the Fairlight Command Line.